When I was younger Valentines Day involved giving an anonymous card to someone you kinda liked. Easter involved a gift of chocolate eggs. At the end of the school term your teachers said “right that’s it, piss off, see you all in September” and everyone gave a sigh of relief and went for a smoke – often both the teachers and pupils. Now though before Christmas is fully over we get adverts flogging “that perfect Valentines gift for someone special” and it’s not just expensive jewelery but DVDs, Tablet computers and phones. Now I’m not unromantic but I don’t confine my displays of affection to blingy jewelry in February. Next there’s Mothers’ Day and Fathers’ Day which has also moved beyond flowers or chocolate, handmade gifts and cards to similar flogging of expensive electronics, and the card aisle also now includes cards for husbands to send to their wives and vice-versa on these days and even Mother’s Day cards for Aunties. The inevitable next step is the largely informal Grandparents’ Day, not that I have a clue when that is as I haven’t seen the adverts for it yet. Today I’ve seen an advert for a remote control BMW toy headed with “struggling to find that perfect Easter gift”. What, we now have to buy actual toys and expensive electronics for Easter too? Finally, just when you think the gifting season is over the kids are breaking up from school and are encouraged by marketers to take a parting gift for their teacher(s), to remind them of all the little darlings they’ll be missing dearly over the six weeks holiday. This year has even seen an advert of choice items teachers can buy for the pupils. Now I love giving gifts to people, I’m able to, but these additional gift-giving times apply increasing pressure on people to give increasingly expensive presents or risk appearing to not care, or being left out. With all these days seen as just another marketing opportunity its easy to believe that today the thought no longer counts. I like to think though that that’s not true. 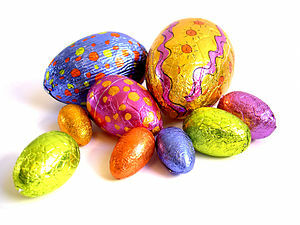 By the way, remember there’s still five shopping days ’til Easter.